We are a “different” company. Making prototypes was the work and the life of our father. A working life spent in Stilnovo, the first truly great forerunner of Italian design, in lighting technology. In 1978, on invitation of Stilnovo, we gave life to the old Company “Contardi Maria”, from our mother’s name. All the machining operations, too complex to be carried out in Stilnovo (as Spinnaker and Topo Joe Colombo), were entrusted to us. While dad was giving a shape to light, I was learning how to shape a Company. From the beginning it was clear that we needed an organized reality that offered to the big names of lighting design a basin of “know how” where other companies of the same field – in Italy and abroad – could tap into. Thus, beside the partnership with Stilnovo were born other collaborations with Quattrifolio, Lucitalia, Lumina and then Armani Casa group e B&B Object Division. the content and tone of voice. We fully understand these briefs and work to provide the best solutions. We don’t just create a light with a design around it. It is interior design with a light that shines within. Diversity is not just a distinctive trait of our products, it is the DNA of our Company. Over the last few years the company strategy is the result of a ‘vision’ that is predominantly based on knowing and understanding both our limitations and the great challenges that are knocking at our door. 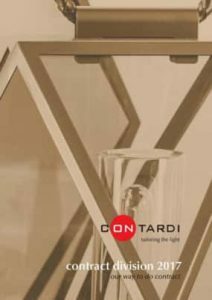 Unlike the traditional lighting world, which normally rotates around the figure of the designer, at Contardi this role is represented by an interior designer, a well-established practice on the international market, particularly in companies with an Anglo-American imprint. This is precisely what has allowed us to strengthen our international profile and pose ourselves on the market as a global company that is proud of its Italian origins. 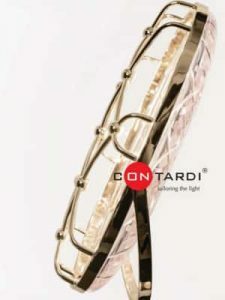 In the space of just a few years, Contardi became a point of reference in the market niche of elegant and refined décor, where timeless style prevails over the current fashion trends. The opening of the NY branch, in 2014, ensures we have a direct presence in one of the principal nerve centres of the world. Our presence at international tradeshows (in both the home and hospitality sector), is part of our operating strategy for the future and will be supported by communication and branding tools that will help make our strategy a tangible reality. NEED MORE CONTARDI INFORMATION ?